The comic book The Exquisite Vanishteer, written & illustrated by Daniel Crosier is available on the digital comic book site Graphicly.com. The comic book is the inspiration for the feature film Isolation Man in production at Crazy Horse Studios, based in Denver, CO and co-directed between Crosier and Dane Bernhardt. The Exquisite Vanushteer comic book depicts the bad day where the Vanishteer, a short-minded, self-idolized superhero has a bad day and accidentally makes the human population vanish. This sets up the film premise where the Vanishteer is forced to resolve his unfortunate deed. Crosierâ€™s interior artwork was the result of a weekend experiment with ink, charcoal, and the loose cartoon stylized approach. For more information please contact Daniel Crosier at vanishteer@gmail.com, 720-236-6339, www.thothengine.net. DENVER BASED FEATURE FILM, COLFAX & 15TH , PREMIERES AT THE DENVER FILM CENTER, MONDAY MARCH 5TH AT 7PM. January 26th, 2012 · Comments Off on DENVER BASED FEATURE FILM, COLFAX & 15TH , PREMIERES AT THE DENVER FILM CENTER, MONDAY MARCH 5TH AT 7PM. AT THE DENVER FILM CENTER, MONDAY MARCH 5TH AT 7PM. Denver, CO â€“ Director Stephen Santa Cruz & cinematographer Joel Stangleâ€™s feature film Colfax &15th will screen one night only at the Denver Film Center on March 5th. The film is a fictional account exploring a faction of Denverâ€™s criminal underworld as it intertwines with the bounty retrieval business. The film features all local actors including Joseph Trujillo and Ariana Sanchez. Q&A with Santa Cruz will follow the screening and Denver. Colfax & 15th is about Issac, a young hood turned bounty hunter, who finds himself caught within a hidden web of corruption. He begins to unravel the shady organization of his employer, Rome, a bail-bondsman whoâ€™s fallen deep into a world of criminality. As Issac tries to reform his life, he is led down a path of deceit into an unseen subculture that teeters on the edge of law and lawlessness. Now, with a child on the way, Isaac must use his knowledge of the streets to survive and collect on one last bounty. The two aspiring filmmakers, Stangle and Santa Cruz, both from Denver, Colorado, set out to make a film that authentically reflected the thriving but loosely monitored bail bonds and bounty retrieval industry in the modern western United States. The screening begins at 7pm. The Denver Film Center Colfax is located at 2510 East Colfax, Denver, CO 80206, in the Lowenstein CulturePlex. To view a trailer of Colfax and 15th, http://crazyhorsestudios.com/Colfax%20and%2015th/trailers.html. For a full downloadable press kit, http://crazyhorsestudios.com/Colfax%20and%2015th/about.html. Visit www.denverfilm.org/filmcenter/ for screening information. Wood burning comic book artist and writer, Daniel Crosier, here. 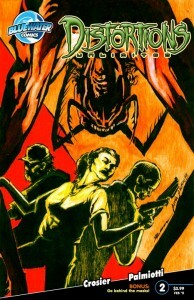 Wanting to encourage comic book stores and vendors to carry Distortions Unlimited #2, set to release in February 2011! To further promote the book, I will do a custom wood burned store logo for every comic book store that orders 20 copies, or more, of Distortions Unlimited #2. I am also open to booking signing/demo/speaking engagements/events for stores in Colorado, as well as nationwide if I can get hotel & travel expenses compensated. Thanks for your time and support! Below is the Distortions Unlimited press release, media links, and contact info. The second issue of the series continues into the horror unleashed on the earth with the collapse of a mine. The plot was crafted with multiple, intertwining layers that combine fantasy and true-life events ripped from todayâ€™s headlines. Local Denver celebrities, Uncle Nasty and Matt Need from Clear Channel’s KBPI and Allana Rizzo from Rocky Mountain Fox Sports Net have lent their likeness to the project. Crosier will bring a unique look to the books by illustrating with his watershed technique. All covers and interior pages of the series will be created with graphite on wood poplar panels. The books will have a high contrast, distressed, organic look. The release date is for the first issue of Distortions Unlimited #2 will be February 2011. Denver, CO- Daniel Crosier, writer & director, is organizing a teaser trailer shoot for the b&w horror feature Sons Of Soil later this summer. The teaser’s purpose is to garner more investors, attention & promote the larger feature film project to be shot at a later time. SONS OF SOIL centers on three backwoods characters in a triptych of short stories greatly influenced by such films as The Texas Chainsaw Massacre, Fellini’s 8 1/2, and Tetsuo The Iron Man. The pre-production on the trailer is currently underway. Interested parties and financial backers may check out Kickstart to pledge funds or to obtain additional information. Crosier is best known for his comic book work. He has exploded onto the comic book scene in the last few years. Illustrating and writing multiple, nationally distributed comic book projects created with an innovated wood burning technique that include, â€œBartholomew of the Scissorsâ€ and â€œDistortions Unlimited,â€ his writing has captured the attention of the industry. Another project Crosier heads is the performance samurai demon/neo-kabuki group OFM: OdAm fEI mUd. Crosier manages and directs the live performance group that includes a band, aerialists, elaborate practical effects, and a multi-media introduction. Crosier explains his vision for Sons of Soil and how his background in comic books background and performance art offers him an edge his new venture in feature film. After a near death experience due to a lifetime bout with chronic asthma and allergies in his early 20’s, Crosierâ€™s unapologetic tenacity is driving him to finish the horror film that began to gestate in his early childhood with inspiration from the plains town of Kersey, Co. For more information about Daniel Crosier visit www.thothengine.net.